Thinking of purchasing some Salty Dog gear? Great! Our shipping department works hard to ensure orders placed by 12pm EST Monday thru Friday are shipped the same business day. Orders placed after 12pm are shipped the next business day. Our preferred shipping method is USPS Priority Mail. If you are against a deadline and need your order by a certain date, please contact us to inquire about expedited shipping. If you already have some Salty Dog gear and would like to exchange it for a different size or color, we have you covered. We make our returns and exchanges easy and fuss free. 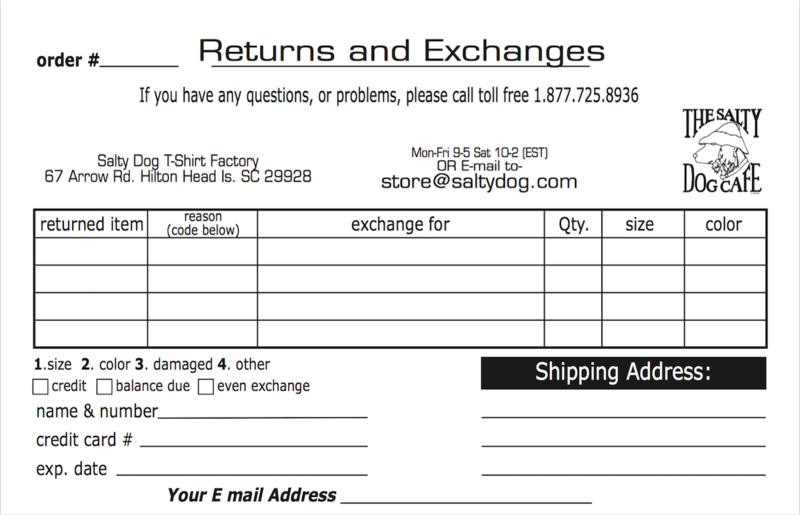 Please enclose a completed Return/Exchange form and the item you would like exchanged to The Salty Dog T-Shirt Factory at 67 Arrow Rd., Hilton Head Island, SC 29928. We'll have you fixed up in two shakes of a dogs tail. Please use our chat feature in the lower right-hand corner of your screen or call 877-725-8936 with any questions.